Many Chinese legends exist concerning the longstanding rivalry between the two creatures of the Crane Versus Snake Dagger. The immortal crane and the cunning snake exhibit qualities that have inspired martial artists for centuries. 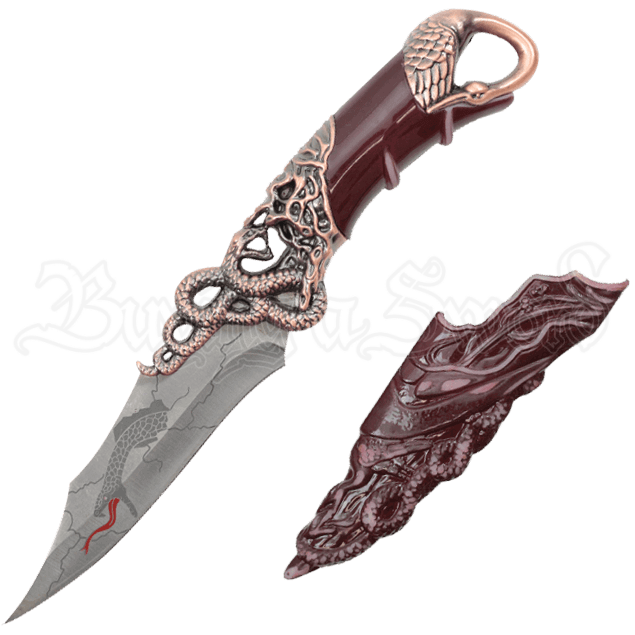 The stylized blade of this fantasy dagger displays an engraved image of a striking snake. In the image, faux cracks mar the surface of the blade while the snake bursts through the center, its long red tongue lashes out as it hisses. Cast metal details with a brass finish create a stunning display on the handle of the dagger. A coiled snake forms the guard while a crane decorates the pommel. The included scabbard echoes the intricate design, matching the antiqued brown grip of the dagger.